Mechanization eventually — that is, after a couple of generations — led to a broad rise in British living standards. But it’s far from clear whether typical workers reaped any benefits during the early stages of the Industrial Revolution; many workers were clearly hurt. And often the workers hurt most were those who had, with effort, acquired valuable skills — only to find those skills suddenly devalued. Many workers were clearly hurt — well, that’s one way to put it. But not so fast, Paul — what do you mean “we”? “We,” of course, means the middle class, which is, I believe, the New York Times ’ editorial policy for framing problems which people have faced for decades as “new.” Now “highly educated workers are as likely as less educated workers to find themselves displaced and devalued,” meaning pretty soon there will be no one with the disposable income to spend on Times subscriptions. A very big problem indeed! [W]hat will happen to us if, like so many students, we go deep into debt to acquire the skills we’re told we need, only to learn that the economy no longer wants those skills? So far, so good, Paul. Glad to see we all agree that this is an eminently political problem, not a neoliberal technocratic one. And he even comes down on the side of a guaranteed minimum income, something discussed in the pages of Jacobin for some time now. But let’s proceed cautiously on our casual stroll with a guy who only recently realized there’s a class struggle going on. If the picture I’ve drawn is at all right, the only way we could have anything resembling a middle-class society — a society in which ordinary citizens have a reasonable assurance of maintaining a decent life as long as they work hard and play by the rules — would be by having a strong social safety net, one that guarantees not just health care but a minimum income, too. But the “work hard and play by the rules” mantra is exactly what got us into this mess! Paul, I’m calling Pure Ideology on your “middle-class society”: you’re slipping management by elites, the villains of this story, back in as the good guys. What every real socialist struggles for isn’t merely redistribution of income. We struggle for control of the means of production, which means not following the rules, but ripping up the old rules and making new ones. That is the only thing that will keep the bosses and bankers from immiserating and enslaving the majority of humanity, which is what “middle-class society” amounts to. This would mean expressing real sympathy with the Luddites: recognizing that all this technology is a weapon used against us. Hell, in the past few years, and especially the last few days, we’ve had to face the awful conclusion that the Internet itself is one giant automated Stasi. And of course, going a few steps further: refusing to work hard, refusing to play by the rules, and ultimately, refusing a lot of this technology that’s supposedly going to make things so easy for us, somehow, some day. Our long-term goal is a society of abundance and leisure for all, but our shorter-term goal is smashing the relations of production holding us down. And part of that may be, as it was for the Luddites, smashing a few machines along the way. What do you say, Paul? Those flimsy paywalls won’t protect even your job for long. 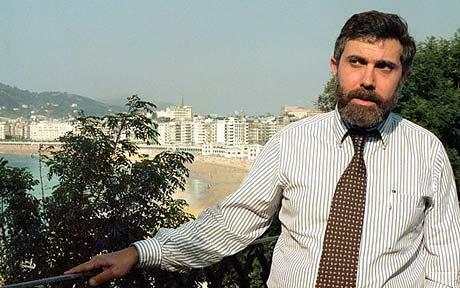 Paul Krugman takes up the banner of the Luddites. Here’s what he gets wrong.